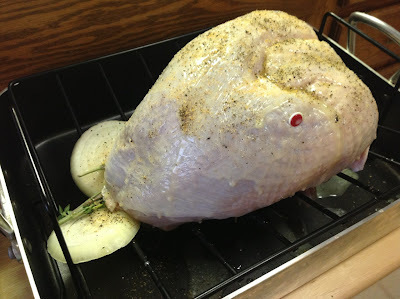 Before this year, I'd never brined a turkey before. The process, meant to infuse turkey with flavor and liquid certainly has its fans. Whole roasted turkeys tend to dry out from spending so long in the oven. Since I usually make turkey breasts, which have a shorter cooking time, I've never had a dryness problem. 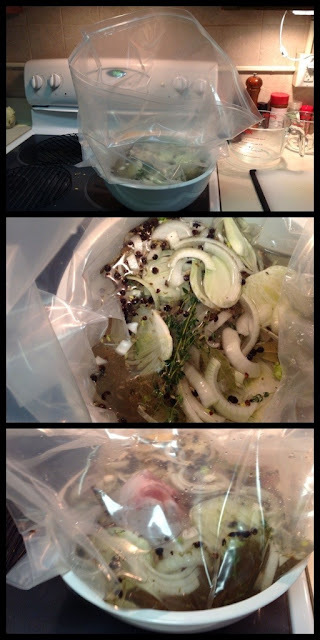 However, I was interested in how brining could improve the meat's flavor. I like turkey just fine, but it's never been my favorite part of the Thanksgiving dinner. Could brining change that? I almost brined last year and chickened out, so to speak, opting instead for more traditional roasted turkey with herbs stuffed under the skin. Getting those herbs under there is a real pain and, while it adds some flavor to the overall dish, it doesn't really do much to flavor the turkey meat. For that, you need to brine. I was concerned the process might make the meat too salty, but a recent talk by America's Test Kitchen guru Christopher Kimball addressed that issue while providing the best explanation I've ever heard for how and why brining works. His new Cook's Illustrated book, The Science of Good Cooking, explains how brining works by diffusing salt into the meat and, through osmosis, moving water through cell walls. There are some important warnings to heed: 1) don't brine a “self-basting“ or kosher turkey, 2) don't brine longer than recommended or the meat will be too salty and 3) don't use too much salt, or the salt will extract moisture from the meat, making it drier. I patted my turkey dry after brining, but letting it set in the fridge overnight after removing it from the brine might have helped brown it even more. I actually broke one of those rules: I brined my turkey breast for 24 hours, twice what Cook's Illustrated says is necessary. Despite that, I was pleased with the results. Very pleased. The turkey was fantastic. The highlight of the dinner. I used this recipe from the latest issue of Bon Appetit, although I did not do the turkey leg and wing confit. I like that this brine recipe included a lot of herbs and spices--their flavor really came through in the turkey. 1. Place juniper berries and fennel seeds in a resealable plastic bag and crush with a rolling pin. Transfer to a large pot or brining bag. Add all spice, salt, sugar and 2 cups hot water. Stir until the salt and sugar have dissolved. Add onion, fennel, parsley, thyme, bay leaves and cloves. Add 3 quarts cold water and stir to combine. Place turkey breast in pot/bag. Cover and chill overnight. 2. Preheat oven to 450 F. Set a V-rack inside a roasting pan. Place onion slices, sage and thyme sprigs on rack. 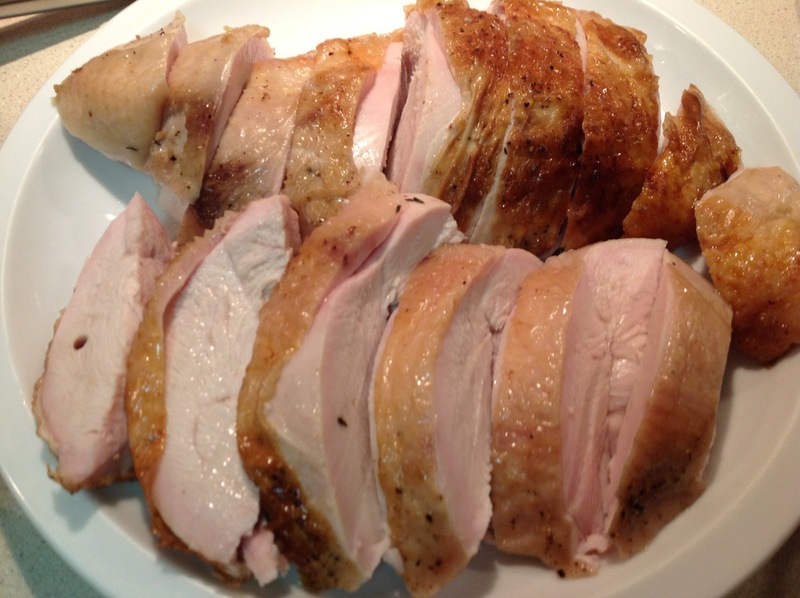 Remove turkey breast from brine and pat dry with paper towels. Put turkey breast on top of herbs on rack. Brush all over with melted butter and season with salt and pepper. 3. 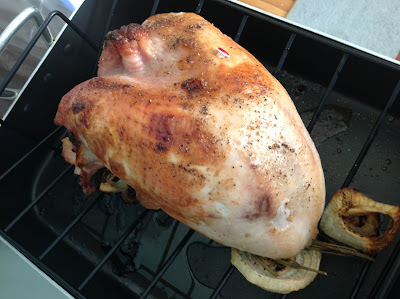 Roast turkey for 30 minutes. Reduce oven temperature to 300 F, cover loosely with aluminum foil, and continue roasting until an instant-read thermometer inserted in the thickest part of the breast reads 165 F, about 2 1/2 to 3 hours total roasting time. Let breast rest 30 minutes before carving. This was the most delicious turkey I've ever tasted. Thanks! I'm glad you liked it and that it turned out good. I was pleasantly surprised by how much I liked this.